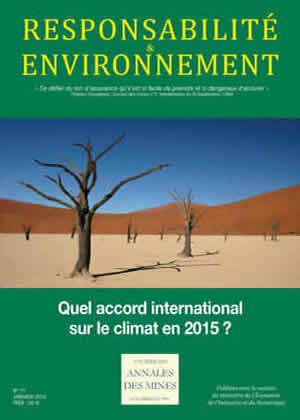 Responsabilité et Environnement - N° 77 - January 2015 - What international climate agreement in 2015? N° 77 - January 2015 - What international climate agreement in 2015? The Paris Climate Conference: What kind of international agreement in 2015? What agreement in Paris in 2015? Changes in global energy: will they be led by policies or driven by events? Which approach should Europe adopt to reach an international agreement?